Hybrid solar inverters performs the conversion of the variable DC output of the PV cells into a clean sinusoidal 50- or 60 Hz current. 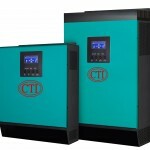 solar inverter is a critical component in a solar energy system. It performs the conversion of the variable DC output of the Photovoltaic (PV) module(s) into a clean sinusoidal 50- or 60 Hz AC current that is then applied directly to the commercial electrical grid or to a local, off-grid electrical network. 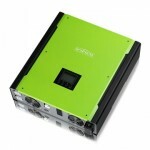 Typically, communications capability is included so users can monitor the inverter and report on power and operating conditions, provide firmware updates and control the inverter grid connection..
Headquartered in Taiwan, Voltronic Power Technology Corp. is a large scale ODM UPS and Inverter manufacturer in Taiwan and China. InfiniSolar is a hybrid inverter which combines solar system, AC utility, and battery power source to supply continuous power. It is suitable for the remote areas where the cost of utility is too high or emergency usage when utility is not stable.It has Pure sine wave output & Microprocessor controlled to guarantee stable charging system. Voltronic Power is a truly remarkable company, with its personnel providing a history rich in service, innovation and growth. Voltronic Power’s professional team is ready to start a new chapter in the global power market.